A traditional denture is an oral appliance, typically made of acrylic that is designed to restore an entire arch of teeth. Dr. Simmons will customize your denture in Spring, TX to complement and properly fit your facial structure, and your denture will rely on a snug fit and suction to stay in place. 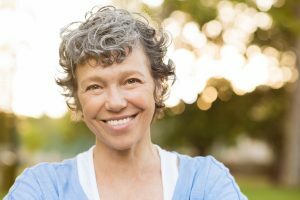 There is a learning curve as patients are getting used to talking and eating with their “new teeth,” however most patients immediately appreciate how their denture restores their smile. Dental implants can be used to support dental appliances such as a denture. By strategically placing a few implants into your bone, Dr. Simmons can design your denture to snap into the implants. This provides better support and a more secure fit than ever before, as denture wearers no longer have to worry about movement or slippage when they talk or eat. Implant-retained dentures also protect the integrity of your jawbone by keeping it healthy and stimulated, where traditional dentures often cause bone resorption, or breakdown. A dental implant in Spring, TX is a titanium post that is placed into your bone during oral surgery. Titanium is biocompatible and will integrate with your bone naturally over time, which take the place of your root. After the appropriate healing time has passed, an implant can be restored with a porcelain crown in order to replace a missing tooth, or it can be used to support an appliance such as a denture or dental bridge. If you’re ready to restore your teeth and reclaim your life, Dr. Simmons would love to hear from you! He can guide you through the process of getting implant-supported dentures from start to finish. Give us a call today to learn more about the possibilities for your smile.